Spring sports are struggling to hit their stride as the weather tries to catch up with the season, but that hasn’t stopped some local athletes from shining through the storms of early April. With fresh arms off a rested offseason, there have been a number of great pitching performances in the young season, on both the baseball and softball fields. Two aces were at their best last week, as Berlin’s Adam Bilinsky and New Britain’s Josleen Rivera stymied opposing hitters on the mound and in the circle. The Berlin baseball team is off to a 4-0 start, thanks in large part to its efficient pitching. A major part of that success has come from right-hander Adam Bilinsky, who put the Redcoats in position to win in their opening game against Guilford, and the team’s win on Thursday against defending Class L champion Wethersfield. Bilinsky went the distance against the Eagles, allowing just one earned run over seven innings while striking out eight. When the Wethersfield threatened to make a comeback and brought the tying run to the plate in the seventh, Bilinsky responded with back-to-back strikeouts to keep Berlin’s perfect record intact, much to the delight of his head coach. Bilinski also credited an effective curveball to his strong start to the season, particularly on Thursday against Wethersfield. The Redcoats have played solid defense behind their pitching staff through the first four games, but their starters have helped the cause by limiting hard contact. Through 5 1/3 innings on Thursday, Bilinski allowed just two balls out of the infield while the Berlin batters put together a three-run lead. That’s been the formula so far for Veleas’ group, as the Redcoats have allowed an average of just 3.75 runs per game. Bilinsky has headlined the team’s solid run prevention, throwing 12 innings in two starts to far this season, both of which have resulted in wins. The Redcoats have no complaints when watching Bilinsky take the mound, as they know that when their trusted righty toes the rubber, they’re going to have a chance to win that day. The New Britain softball team is also undefeated, albeit with a much smaller sample size, as the Hurricanes sit at 1-0 after beating a Wethersfield team themselves last week. New Britain secured a 7-2 victory thanks to an exceptional outing from junior Josleen Rivera, who carried a shutout into the seventh inning and finished with two earned runs on just three hits, while tallying nine strikeouts in the winning effort. The season-opening success is nothing new for Rivera, who pitched a similarly solid game in last year’s opener for New Britain against Newington. The Hurricanes took down the Indians 4-2 almost exactly one year ago, as Rivera threw another complete game while surrendering just five hits and striking out seven. In Rivera’s second year at New Britain after spending her freshman season at a magnet school, Rivera highlights a Hurricanes team that is looking to get back to the state tournament this year, after losing in the second round of the Class LL tournament in 2018. To get back to the postseason, New Britain will likely need more of what Rivera provided the team in its season opener. The Hurricanes lost six varsity starters to graduation last June, and will likely need some time to rebuild their offense. In the meantime, they have just the pitcher to step in the circle and keep them in ballgames. Rivera, an all-conference selection last season, will be looking to build upon a sophomore campaign that saw her enter the New Britain record books after recording a program-high 113 strikeouts last year. It’s still very early, but after one start, Rivera is averaging more than a strikeout per inning and can flirt with breaking her own record by season’s end. 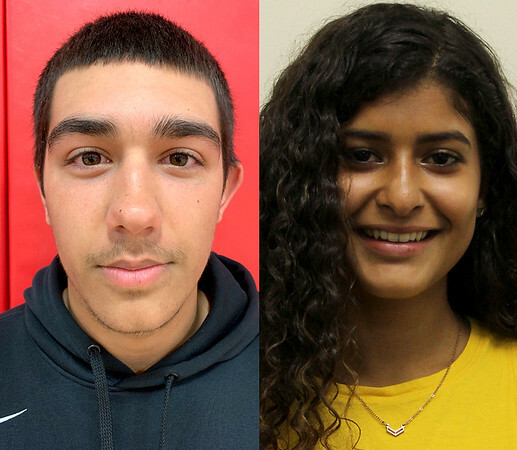 Posted in New Britain Herald, Athletes of the Week, Berlin, New Britain on Monday, 8 April 2019 20:55. Updated: Monday, 8 April 2019 20:57.